Eggplant (Solanum melongena) or aubergine as its known in Europe, is a species in the nightshade family grown for its edible fruit. 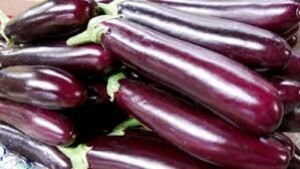 In India and much of Souteast Asia it is also known as Brinjal. 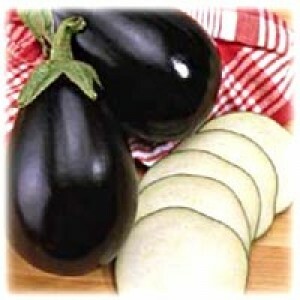 Eggplant may be purplish-black, white or all shades in between — some eggplant varieties even bear orange or green fruit. Start plants indoors 2 months before the soil warms up. 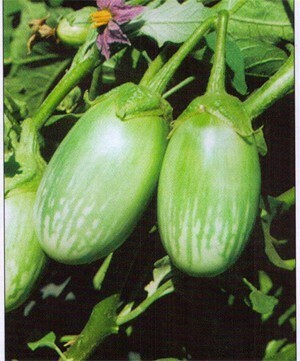 Eggplant seeds germinate best at temperatures above 75 degrees Fahrenheit. Bottom heat is useful in getting the plants up and growing. Keep them growing under bright fluorescent lights for 14 to 16 hours each day, and transplant them to 4-inch containers when they have three leaves. 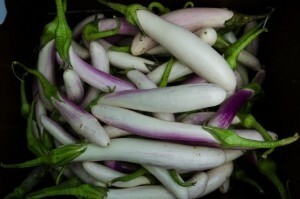 Eggplants come in all shapes, sizes and colors and are prized in the Indian kitchen. 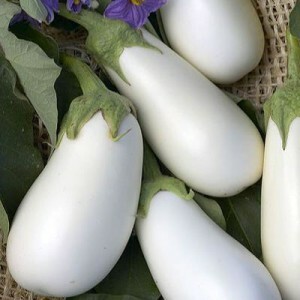 These scrumptious eggplants are easy to grow and do well in the heat of the summer. Ratna is a round to oval variety that's early maturing, and very productive. 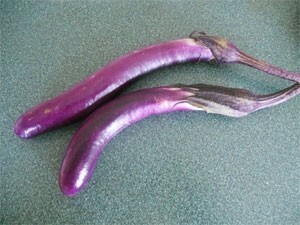 This shape and size is the proto-typical Indian eggplant. 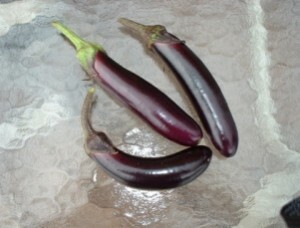 Dark purple, can be harvested while small or large. Oval to round purple fruit with thin white stripes running lengthwise resembling the driving rain. This striking beauty also has excellent flavor. 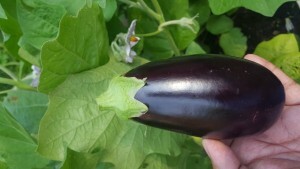 Dark purple variety that is medium long and slightly thick. High yielding. Approximately 100-120 seeds. 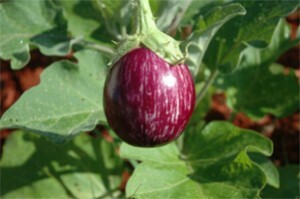 Shiva is a long dark purple-red type eggplant that is widely adaptable and has a strong resistance to diseases. The fruit are 12 in long by 2.5 in wide, and weigh between 400-600g each. Delicious when stir-fried, or in curries or roasted with Indian spices. F1 Hybrid. Distinctive coloration of this glossy white eggplant with lavender streaks and green calyx is a welcome addition to any garden. The slender fruit grow up to 8" long. Its great for grilling and stir frying. Very productive variety. F1 Hybrid that is long(7-10 in), waxy and green. Matures in 50 days. Approximately 100-120 seeds. 1 oz 5000 seeds. 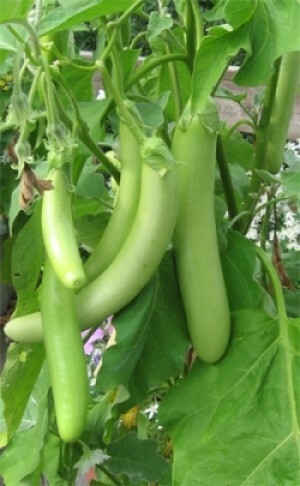 Light green oval shaped eggplant with white streaks at blossom end. Vigorous thorn less plants bear fruit that can be harvested from 8 oz to 2 lbs. Excellent used in the Gujarati vegetable medley called undhiyu. Hy, T.
This selected eggplant is round and resembles a green marble, light green color with dark green line pattern, 5 x 5 cm diameter. A variety that was made famous in Karnataka where it is known as "matti gulla", and is offered to Lord Krishna. Maturity is in 40-50 days from transplanting. 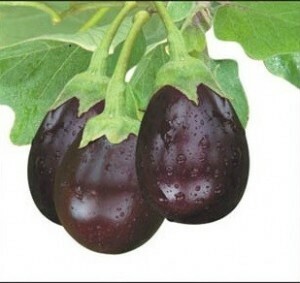 Gorgeous teardrop shaped eggplant featuring dark purple-black fruit which are extremely consistent in size and shape. They are borne on strong plants with ample foliage. Excellent for Indian curries, bharta and for roasting. The oval fruits average 8 inches long and 3-1/2 inches wide. The fruits are 1 to 3 pounds in size. Tolerant to Tobacco Mosaic virus. The flesh is pale yellow, and ideal for breading and frying. 73-85 days to harvest. Approximately 100-120 seeds.